Cinco de Mayo, TGIF, kicking back on a relaxing summer day—these are just a few thoughts that come to mind when we think about mixing up a batch of margaritas. While you can’t go wrong with the standard combination of sour mix, tequila, and orange liqueur, there are plenty of ways to take this classic cocktail to a whole new level. Let’s start with the base ingredient: sour mix. Store-bought sour mix works in a pinch, but when you want to pull out all the stops, homemade sour mix is the way to go, and well worth the advance planning. It’s super easy to make, and can be done ahead of time. Making your own sour mix also means you can get creative with the overall flavor of your margarita, infusing it with fresh herbs, spices, or even swapping out some of the lime juice for something more special-event worthy, like blood oranges. In this version, we stayed true with lime juice, but jazzed things up by infusing the sour mix with fresh jalapeños. The mix can be prepared up to one week in advance, then stored in a tightly sealed jar in the fridge (skip straight to step 2 if making the sour mix ahead of time). Instead of the usual salty rimmed glasses, a combination of sugar, salt, and smoked paprika ensures your margarita stands out amongst a sea of overcrowded cocktails. Chili pepper can be substituted for an extra kick. And don’t forget the finishing touch—the garnish. 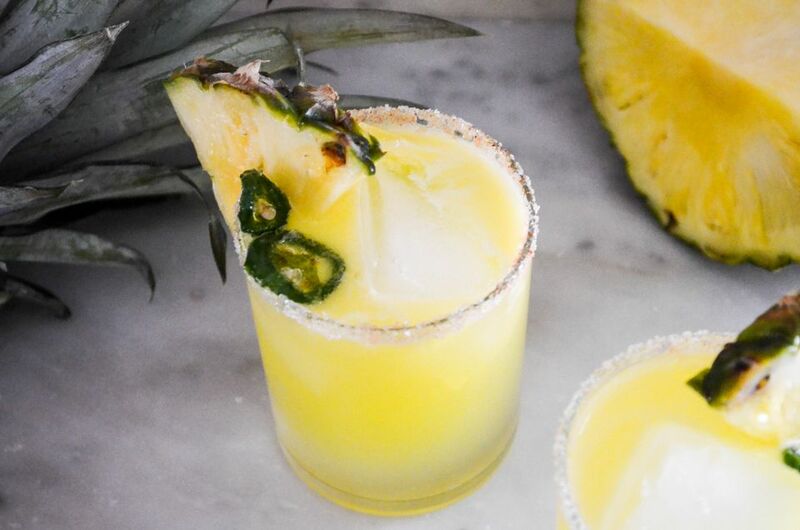 A pineapple jalapeño margarita wouldn’t be complete without a pineapple wedge, but we’ve also included a devilish twist with candied jalapeños. You might want to double up on that part of the recipe, as they’re a pretty addictive, albeit spicy, snack, and great add in for salads. If you’re pressed for time, sliced, fresh jalapeño work well, too, but the candied ones are a fun accessory to a sweet, smoky cocktail sure to impress friends and family at your next gathering. Cut one jalapeño into thin slices. Combine 1 1/2 teaspoons sugar with 1 teaspoon of water in a small, non-stick skillet. Heat over medium flame until sugar is melted, and the mixtures is lightly golden. Add the jalapeño slices, and cook, shaking the pan frequently until peppers are fully coated, and the syrupy mixture is deep golden, 1 to 2 minutes. Using a fork, transfer the jalapeños to a parchment-lined plate. Split the remaining jalapeño in half. Add it to a small pot with 1/4 cup sugar, lime juice, and 1/4 cup water in a small pot over medium-high heat. Bring to a boil. Reduce heat to low, and simmer until sugar is completely dissolved, about 2 minutes. Remove from burner, and let cool completely. Discard the jalapeño pieces. In a shallow bowl or small dish, combine the remaining teaspoon of sugar, salt, and smoked paprika. Use the lime wedge to swipe around the rim of four rocks glasses. Dip the rims in the paprika-sugar-salt mixture, shaking off any excess. Fill a cocktail shaker with ice. Add the lime-jalapeño syrup, pineapple juice, tequila, and Cointreau. Shake until beads of sweat form on the outside of the shaker. Fill the glasses with ice cubes. Divide the cocktail between the glasses. Garnish each with a pineapple wedge and a few pieces of candied jalapeno. Serve immediately.